As I mentioned before I grew up eating a lot of different casseroles. I’ve found over the years that these various recipes can have variations from family to family, and even year to year. Let’s face it who hasn’t tried to finesse a casserole to make it a little newer…a little better. 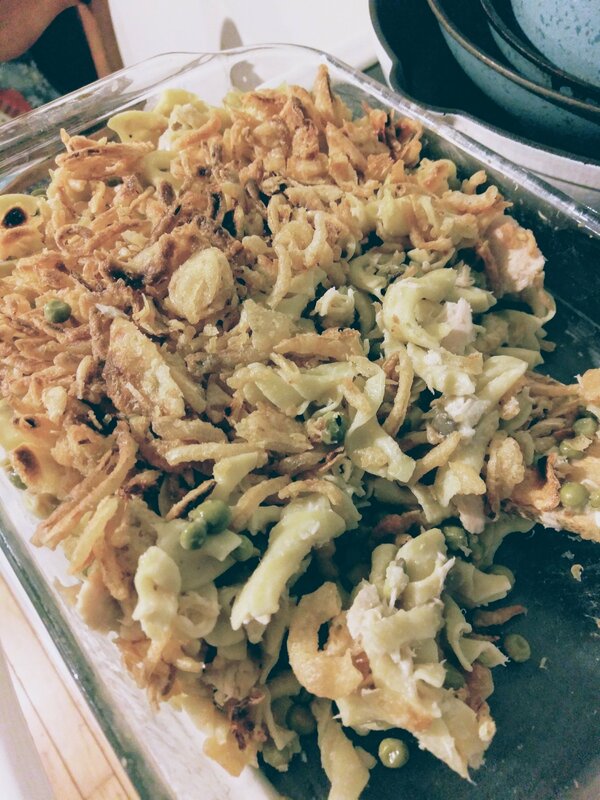 Tuna Noodle Casserole is one of those dishes that I have seen so many wide ranging variations. Everything from different soups used, to different veggies added, and even the crispy topping! I use french fries onions but I have heard of people using crushed potato chips, and even cheese. Tuna Noodle Casserole is a great recipe on busy night, it’s fast, easy, and usually a crowd pleaser. I’m of course adding my recipe here but I would love to hear how you make yours! Enjoy! Cook the pasta according to the package directions, drain and stir in mushroom soup, tuna, and peas. Pour into a 9x13in glass pan, and top with the crispy onions. Broil on high heat until topping is golden brown. Serve hot. Enjoy!